I had a book printed on a short print run to help raise awareness around the issues of child abuse and mental health, which I am glad to say it did. Many of the words from the book can be heard for free via youtube videos of poems & stories from it. Most of the copies of the book were given for free to genuine people or causes with some used to raise money for Samaritans etc. Back cover description: "This book is an expression of true feeling and thoughts through Poetry & Prose. It portrays the world of Child Abuse, the forced silence & inner one too. It goes through the range of emotions dealing with the consequences and aftermath of Abuse not least through the effects later in life with Mental instability & illness. It is a true, accurate and completely honest portrayal of the suffering & injustice but also of the hope too. And just like my real life story. I hope that the love contained within these pages are not too hidden from you as you turn them, but most importantly of all... when you finish the last one"
"I am inspired by the raw vulnerability expressed by John within these pages"
"If we allow it to, this book will challenge us to be real with our emotions and just may be the key to unlocking our own whispers from within." "Many people use poetry as a cathartic tool, but few reach the goal of touching others with the strength of their work. John does." 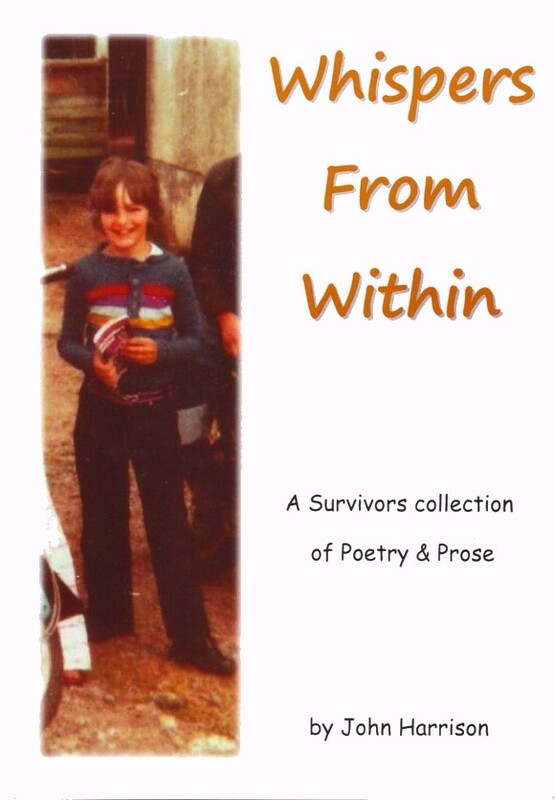 "Johns poems have allowed me to have a clearer understanding of scars left by childhood abuse." "I received this book. I wasn't disappointed, it was all I expected & more. John has a fantastic way of expressing himself through his poetry." "John Harrison's journey through his inner turmoil and experiences and in dealing with the mental health system should be shared among the profession as an account of how it can fail an individual, lessons could be learned." "He shares this in a style that is not contrived." "The writing is uncensored and sensitive. The reader will say, "That's exactly what I was thinking/feeling but could not put into words." "Mr. Harrison writes these thoughts and emotions with an edge that is too clever to ignore." "The poems are poignant and powerful, with profound phrases that are enlightening."